Looking for a relaxing get-away-from-it-all break in the French countryside? La Grange will suit your needs perfectly. Located in the middle of Nouvelle-Aquitaine, one of the sunniest regions of France, La Grange enjoys warm summers boasting temperatures well into the 30s. You’ll find lots to see and do both locally and across the region. 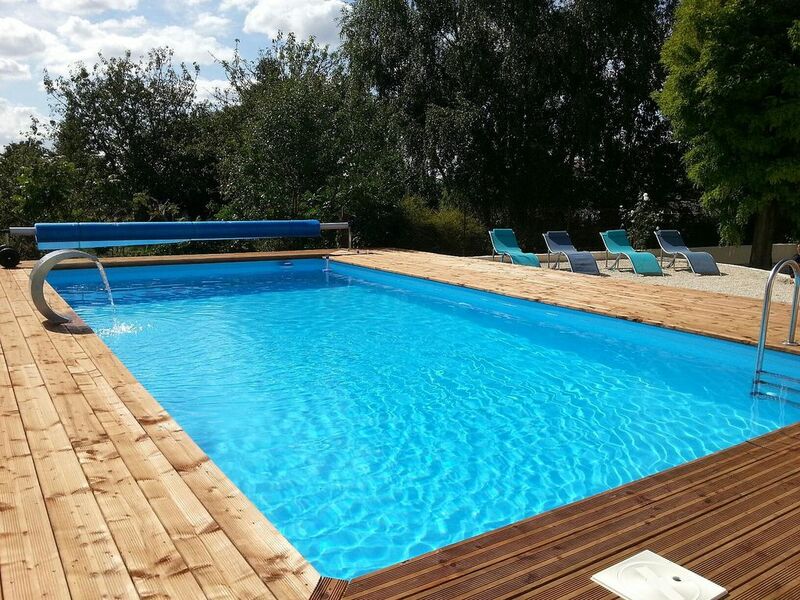 Explore the countryside, sample the many fantastic restaurants in the local area, take a stroll down to the village for a bière, or just laze in the sun with a good book after a dip in the pool - you'll find plenty to occupy yourself during a relaxing stay at our French retreat. I'm a free spirit and have always loved to travel. Taking a sabbatical some years back enabled me to live the dream and circumnavigate the globe. That trip truly changed my life; I shall forever have itchy feet! When I'm not travelling or hosting I work/live in London, running a marketing consultancy business called thecoalshed. La Grange is very much a home, having been in our family for almost 25 years. When we are not able to spend time here ourselves, we like nothing more than to share our home with family and friends - both old and new. The best think about La Grange is the peace and tranquillity. I can pretty much guarantee that you'll get the best night's sleep that you've had in a while. As there is little electrical light interference in the area, on a clear night the skies are a sight to behold. Probably one of the best features of La Grange is our heated pool. It's the perfect way to cool off in the mid-afternoon heat - or sit besides with a beer as the sun goes down. An ideal getaway for families or a group of friends, La Grange has four good-sized double bedrooms and two large bathrooms. The heated swimming pool is set in private grounds, available for your exclusive use. Water temperature ranges from mid to high 20s. For your safety, the pool is protected by an alarm. The country-style kitchen has everything you’ll need for a self-catering holiday including; a fan-assisted oven; two fridges and a freezer; a full-size dishwasher; a washing machine and tumble dryer. The dining area seats eight, comfortably. You can access Netflix or (UK) freeview TV from the comfort of the lounge-snug. Otherwise, curl up with a good book from the library, watch something from our DVD collection or play one of the many board games - all with a glass of local wine or two, of course! A travel-cot, high chair and stair gates are available for families, on request. All bedding, linen and towels are included at no extra cost. Michael and his family were excellent guests. I would gladly welcome them back to stay in the future. Wonderful and relaxing two weeks in a superb villa. Thanks again Mike & Sally. It was a delight to share our home with Mike and Sally. You are welcome to return to La Grange at any time. You will find La Grange in the beautiful and quiet countryside of Poitou-Charentes, surrounded by wheat and sunflower fields, a cycling paradise. The period farmhouse is close to amenities such as the excellent bakery and little café in the beautiful village of Lizant, not three kilometers away, and the flourishing market, traiteurs, cafés and supermarkets of Civray, a charming town just a little farther away in the opposite direction. The period farmhouse itself is both spacious and cozy, and the renovation was a family project and a labour of love. Mike, the landlord, promptly answers all questions, and Sally, who lives nearby, takes very good care of tenants. The house is extremely well equipped, from barbeque to books, and the well-maintained pool completes this ideal retreat. The fascinating region has been a crossroads of civilizations. The first thing we did, when we returned home after our first summer, was to reserve for a second year. We have still not seen all the historic sites, picturesque villages and diverse restaurants in the area – and we plan to return for a third year. It’s always an absolute pleasure to have Alex and family to stay! This was the perfect property for a relaxing family holiday. We were two families and our children all loved the heated pool which kept them entertained all week, even when we had some rain. This gave the adults plenty of opportunity for relaxing on the loungers on the decking. There is a small village within walking/scooting distance (about 20 mins) where there is a bakery which sells croissants, pain au chocolate and delicious bread etc. The bar in the village also does food and has a pizza night. There are supermarkets only a short drive away for supplies and lots of pretty villages nearby to explore by car. We also did an evening visit to Futuroscope which we all enjoyed. The property itself is very clean and well maintained. We can't wait to visit again. Spent 3 wonderful weeks here in September and thoroughly enjoyed it even though the weather could have been better for the first fortnight. The house is very clean, homely and very well equipped and EVERYTHING WORKED including lovely, modern bathrooms with excellent showers. It has a good sized garden for games and a lovely, heated pool. This is without doubt the easiest and quickest villa we have ever rented (in 20 years) and the communications with Mike were simple, straightforward and FAST. It made booking a pleasure and instructions ,directions etc. were precise and accurate. If we needed anything we contacted Tony and Tina ( The managers) and they were really helpful. The nearby village of Lizant is really scenic with friendly people and a chocolate box mill and a clear, gently flowing river. It also has a great Boulangerie but unfortunately the Fish and Chip shop has now closed! There are plenty of places to visit within a fairly easy driving distance such as La Rochelle Aquarium and Crocodile Planet as well as small picturesque villages. In short we would DEFINITELY RECCOMMEND La Grange to couples or families for a lovely stress free holiday with a MINIMUM of BOOKING HASSLE. ----Alan & Val. This is the second time I've stayed at this property and it won't be the last. The bedrooms are comfortable, well equipped kitchen, lots of DVD' storage watch and the pool and garden are great. Even has the all important wifi ! The owner is a pleasure I deal with and responds to any queries promptly. Location is great for days out but house is also nice and private. The local area has plenty to offer for adults and children alike. In the summer months, a tapestry of sunflowers and poppy-edged wheat fields surround La Grange. There is an extensive network of marked pathways from the house, perfect for rambling or cycling. For foodies, there are some fabulous restaurants serving the very best of local French cuisine at fantastic value, within an easy drive. Close at hand is the pretty village of Lizant (35 minute walk or a 5 minute drive) with a bakery and shop; serving bread and pastries made on the premises along with a bar and pizza restaurant where you can hang out with the locals. Kayaking, canoeing, fishing, horse riding and cycle hire are available locally. Poitiers has been the provincial capital since Gallo-Roman times. Its pedestrian precincts, restaurants, pavement cafes, shops - and some wonderful central gardens - make for a great day's sightseeing. Futuroscope is France's second most visited theme park, with a collection of virtual-reality rides, which draw you into the action on screen. Not to be missed. La Vallée des Singes (Monkey Valley) is a primate park located in Romagne. Meet 34 primate species in a place where 450 animals roam within 18 hectares of a natural wooded park area. Angoulême is an attractive walled citadel, packed full of fabulous restaurants, boutique shops and funky bars. The cathedral, of Romanesque origin, was extensively renovated in the 19th century. Cognac is the home to one of the world's best known brandies. Visit some of the great cognac houses and cellars including Remy Martin, Hennessy, Martell and Courvoisier. Extensive tours and tastings are available daily. La Rochelle is an historic Atlantic port city, with medieval fortifications. The aquarium is one of the most visited attractions in France. Our nearest coastal beach is located south of here, at Châtelaillon-Plage. Dependent on your budget and preference, there are a number of ways to get to La Grange. If you wish to fly, the closest airport is Poitiers (50 minutes), which enjoys four direct services a week from London Stansted with Ryanair. Alternatively, Limoges (1 hour 10 minutes) is a good option, serving many UK airports daily including London, Manchester, Leeds, Nottingham, Bristol and Southampton. Other airports worth considering include Bordeaux, La Rochelle and Tours (all under 2 hours away). Another great way to travel is by Eurostar using a connecting TGV service via Paris. Surprisingly quick and easy, it takes just 5 hours 30 minutes to travel from London St Pancras International to Poitiers. If you prefer to drive from the UK, the nearest channels ports are St Malo and Caen, which are around 4hr 30 minutes away. Calais and the Channel Tunnel are around seven hour drive. Car hire is available from all airports, Poitiers train station and locally at Ruffec. To confirm your rental, a deposit (25%) is required at time of booking. The balance (75%) along with a £250 refundable security deposit will be due 90 days prior to holiday start date. Peak Season rentals run from Saturday-Saturday. You are free to arrive from 4pm on your first day. Check-out is no later than 10am on your final day. The property will be professionally cleaned prior to your arrival. Bedding, linen and towels are included in the rental price.